Helichrysum #4118 is from Bosnia Herzegovina, as is #118. We believe both oils are of equal quality, but they are from different distillers. Everlast or Helichrysum italicum is the active ingredient in many high priced skin care products. Its cell regenerating qualities effect not only the skin and liver but the entire body. It is used for healing of even old scars and cheloids as well as preventive and curative wrinkles treatment. As the quantities of Corsican oil have apparently become smaller prices for oils from Bosnia and Herzegovina have been pushed upwards by large corporate buyers. As far as therapeutic efficacy goes the Bosnian oils are equally effective as the Corsican distillates. While there may be therapists who have developed a special relationship with the Corsican oil and hence have their best results with this variety the Bosnian oils have a higher diketone content. 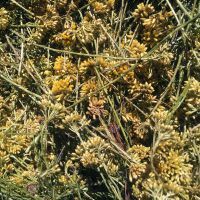 Diketones are the components responsible for the antioxidant and tissue protective qualities of Helichrysum italicum essential oil. As a professional skin care specialist I use this in almost all my antiaging forumlations. Must say that both the Helichrysum sold by Original Swiss Aromatics are the best you can purchase anywhere! Way to go guys.